• Marijuana use among teens rose in 2011 for the fourth straight year which is a sharp contrast to the decline that had occurred in the preceding decade. Daily marijuana use is now at a 30-year peak level among high school seniors. • “Synthetic marijuana,” which until earlier this year was legally sold and goes by such names as “K2” and “spice,” was added to the study in 2011. The study showed that one in every nine high school seniors (11.4%) reported using that drug in the prior 12 months. 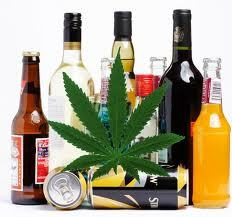 • Monthly alcohol use, and, importantly, occasions of heavy drinking, continued a long-term gradual decline among teens. • Energy drinks are being consumed by about one third of teens, with use highest among younger teens. MTF is, it may not fully reflect what is going on with the teens in our county. Substance abuse professionals are reporting the same increases that are being reported nationally in the use of marijuana, but we are not seeing the same decline of alcohol use among our teens.